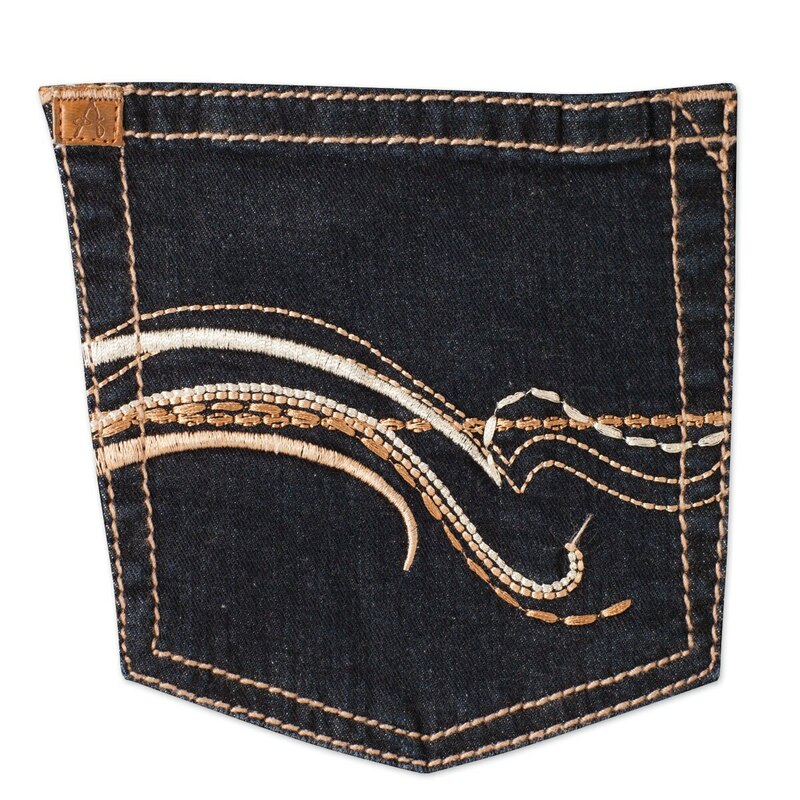 Aura from the Women at Wrangler® has redefined what it means to shop for and fall in love with a pair of jeans. Based on proportional sizing, Aura jeans are designed to fit your ideal rise and leg length. Come find your aura- you've found your new favorite pair of jeans! We recommend that you size 1 full size down from your normal size. Ultra-high rise, super wide flare leg, hand sanding on dark denim with whisker details. Aura Instantly Slimming™ Jean- BT Wash is rated 4.4 out of 5 by 48. Rated 5 out of 5 by Jane14 from Super comfortable I had no time to break these in before spending all day in the saddle. They were very comfortable and the weight of the material is very good for hot days. Even though the material is a good weight it is also tough and upheld nicely during some cow gathering in the brush. Rated 4 out of 5 by nickname from it's a jean Fits well, although a higher rise would be nice. Fabric has lots of give. Rated 5 out of 5 by Sadie from Very comfortable Only jeans I wear!! They last a long time and are so comfortable. Runs large so buy 1 to 2 sizes smaller. Rated 5 out of 5 by Jo A from They look fantastic I had to order down 2 sizes! Two of my friends bought them because I wore them to work. Fantastic price and nicely made. I bought them because of the pocket. Rated 2 out of 5 by Bella from well made jeans These jeans seemed well made but the fit is very loose in the front from the bottom of the zipper up to the waist did not fit well the length seemed good for me I am 5'3"
Rated 5 out of 5 by eoxford from GREAT JEANS! These are great bootcut jeans! I am pretty curvy and these fit just right! Nice fit through waist with no gapping and no muffin top... perfect length (I'm 5'8" and can wear with flats or a very low heel). And I really like the dark color and the fabric feels high end, so I feel like $50 is a good price for these. Very nice, high quality jeans! I'll be getting another pair! Rated 5 out of 5 by ZoomsMom from Great fit Great fit even with curves! 5'3" and the short length is great with a low heel pair of boots. Rated 5 out of 5 by Sandy from Fabulous Jean Great Jeans, light weight and very comfortable. Will order another pair. Rated 5 out of 5 by wf05 from Perfect riding jean! These are by far the best riding jeans I have ever purchased. They're not only flattering just to wear out, but they have stretch so you can move right with your horse in the saddle and no gapping!